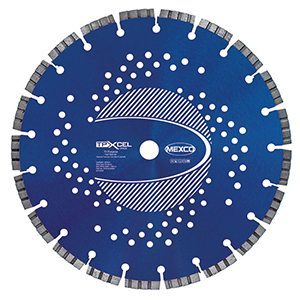 A diamond blade for superior cutting performance on all general purpose building and construction materials including abrasive, non abrasive and asphalt. Designed specifically to take away the hassle of having to change diamond blades for different materials. This blade has been developed using only the most advanced manufacturing techniques; TCT undercutting protection ensures the segments are protected against undercutting (which renders the blade not only useless but dangerous). The steel centre has ventilation holes for cooling and the segments have been laser welded. You would struggle to find a more superior, general purpose diamond cutting blade! Suitable for cutting most materials such as; Reinforced Concrete, Concrete Block, Asphalt, Ductile Iron, Granite, Engineering Brick, Limestone and Breeze Blocks.